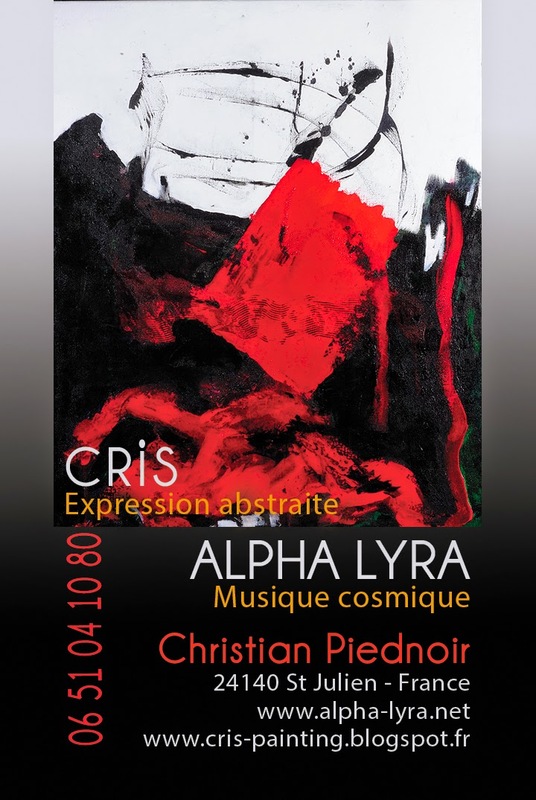 Alpha Lyra and Cris are the two avatars of French artist Christian Piednoir. They are expressed through two creative concepts: painting and music. Here the artistic parellels unite, the cosmic music melting into the abstract canvasses of the other. Several projects are planned for 2015; a new album to be released by Alpha Lyra and expositions from Cris....watch this space! Retrouvez ici des informations sur le monde de la "cosmic music", principalement celle d'Alpha Lyra. Mais aussi des rencontres avec les grands noms de la musique électronique (Klaus Schulze, Tangerine dream, Brian Eno, Cluster, Ash Ra et les acteurs de la EM française et internationale). Some news around the world of the ALpha Lyra's "cosmic music". Actualities of Klaus Schulze, Tangerine Dream,, Brian Eno, Cluster, Ash Ra and all the actors of the French and german electronic scene. Qui se cache sous le nom d'Alpha Lyra Who's Alpha Lyra ? Alpha Lyra est le pseudonyme musical de Christian Piednoir, photographe et éditeur animalier. Alpha Lyra (appelée aussi Véga) est le nom de l'étoile la plus brillante du ciel boréal. Sa particularité est d'appartenir à la seule constellation représentant un instrument de musique, la lyre. Alpha Lyra is the pseudo name for the musical composer Christian Piednoir, also photographer and publisher. Alpha Lyra (also called Vega) is the brightest star of the northern sky and belongs to the only constellation representing a musical instrument, that of the lyre. Thème Awesome Inc.. Images de thèmes de sololos. Fourni par Blogger.